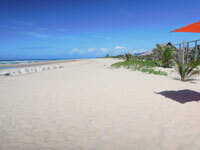 Mozambique hotels, accommodation and places to stay. Guide to where to visit and where to stay in Mozambique. Mozambique is a hidden gem on the Indian Ocean coast of East Africa. The capital of Mozambique is Maputo in the south, with quaint Inhaca island just a short flight from Maputo. Further north are Tofo and Barra excellent locations for diving holidays and family holidays. The peaceful Bazaruto and Benguerra islands lie off the coast from Vilanculos while in the far north is the exclusive Quirimbas Archipelago with islands such as Quilalea, Ibo, Matemo and Vamizi off the mainland from Pemba. Mozambique is a perfect place for a honeymoon, diving holiday, family holiday or just to escape from the modern world. Try Snorkelling with Whale sharks, a dhow cruise at sunset, swimming with Dolphins, diving with Manta Rays, stroll along the beach, enjoy tasty seafood or relax by the pool, Mozambique can offer you all this and more, in addition add on a few nights in Kruger National Park for the perfect bush and beach holiday. At Mozambique Travel Service we are happy to help you with hotel accommodation in Mozambique, flights, car hire, diving or a complete Mozambique holiday. 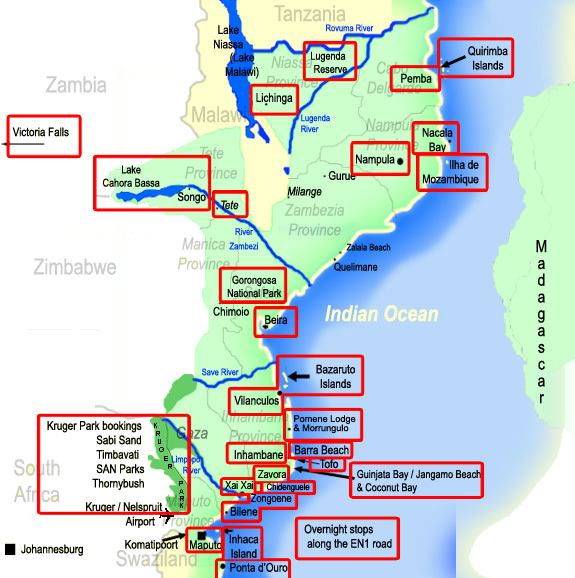 We have visited these places and the photographs featured on this site have been taken by us while we were there, so for a knowledgeable, professional service for your visit to Mozambique talk to us. Ponta do Ouro known for its good beaches, great swimming, excellent diving and fishing with plenty options for accommodation - access by 4wd only lodges will collect from Kosi Bay border. Maputo the capital of Mozambique, a compact city with the Indian Ocean on two sides, vibrant nightlife, good seafood restaurants and plenty hotels from budget to 5 star. Inhaca Island just across the bay from Maputo, an ideal getaway from busy life, daily flights and at the weekends a ferry take you across to this sleepy Mozambique Island. Beline 180 km from Maputo this sleepy village has a variety of accommodation and has lovely sandy beaches around a tranquil lagoon with a sea entrance. Great for families and fishermen. Chidenguele out on a sandy peninsula this is a lovely area for those who want peace and quiet away from the crowds and resorts. Small lodges offering good value. Xai Xai a good place to stopover on the way north, excellent fishing beaches and good fuel supply. Inhambane is the main town along the southern coast, fuel, supplies and gateway to Barra beach, Tofo and Guinjata. Barra Beach one of the main areas for holiday makers in Mozambique, a long sandy beach with a selection of lodges, self catering chalets and plenty to do in the area. Tofo small village and a hub for divers, snorkellers and sunseekers, a selection of accommodation options, restaurants, bars and lovely beach make Tofo a relaxing place for a holiday. Linga Linga across the bay from Barra beach and accessed by 4wd or boat transfer only, the remote beautiful sandy beaches are perfect for honeymoons, families or those seeking escape. Maxixie nothing really to see here but a good place to get fuel on the road north. Pomene / Morrungulo / Ngulane this part of the coast is all old coconut plantations so plenty swaying palms and long sandy beaches, 4wd preferred to get to these remote peaceful places. Vilankulo / Vilanculos busy seaside town with a selection of restaurants, accommodation and a vibrant nightlife and gateway to the Bazaruto Islands. Bazaruto / Benguerra these beautiful islands known as the 'Pearl of the Indian Ocean' are perfect Island escapes, accommodation choices are top end lodges. Beira bustling port city and nearest airport to Gorongosa National park. Gorongosa National park is Mozambiques major wildlife reserve and is now open after extensive rebuilding of the accommodation and roads, fantastic birding and a wonderful wildlife experience. Gorongosa National Park The rehabilitation of Gorongosa National Park in central Mozambique represents one of the great conservation opportunities in the world today. Tete / Cahorra Bass Dam Tiger fishing centre for Mozambique, most of Mozambiques electricity is created by the dam also the hottest place in the country. Nampula city north of the Zambezi river, nearest airport for access to Mozambique Island (Ilha De Mocambique) a couple of hotels and fuel available here. Nacala peaceful bay with fantastic diving, not easy to get to but more difficult to leave as after a few days you will adjust to the wonderful pace of life. Ilha De Mocambique a world heritage site with amazing history and full of crumbling old buildings forts and people all hanging on to this small piece of history in the Indian Ocean. Niassa reserve the most remote and untouched part of Mozambique, from the shores of Lake Malawi (called Lake Niassa in Mozambique) Niassa offers the ultimate pioneering safari in a part of Africa still wild and untouched. Pemba the most northerly city in Mozambique and runs as if the rest of the world does not exist, beautiful beaches, peaceful people and gateway to the Quirimbas islands and Lazarus banks. Quirimbas Islands a group of exclusive islands stretching along the northern coast, luxury lodges with excellent food and service, watersports, snorkeling, diving and sunbathing in such a remote area make it the perfect escape from all the world. 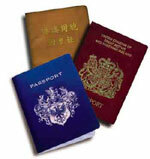 Everyone needs a passport to enter Mozambique. Roads are in variable condition throughout the country, speed restrictions are enforced in small villages and although you can now reach many places in a normal 2wd you need to allow extra time for driving at a reduced speed. What papers do you need for your vehicle ? If the vehicle is on hire purchase / bank loan you will also need a letter from the bank giving permission to cross the border. Also if the vehicle is not yours you will need a letter of authorization from the owner saying you have their permission to take it into Mozambique. How warm will it be? Mozambique crosses the tropic of Capricorn giving the country of Mozambique a tropical climate with plenty of sunshine all through the year it rarely gets cold. What currency can you use in Mozambique and how much is the local money the Metica worth? A variety of places along the main road from South Africa to Vilanculos great places to break the long journey and continue on the next day feeling refreshed. The fascinating capital city with the Indian Ocean on two sides and a cafe/street life that can absorb you for hours. A diverse African city which is always warm in both temperature and welcome. At the very southern point of Mozambique is this small village of Ponta a haven for divers fishermen and watersports enthusiasts. Only 34km from the Kosi Bay border it is a very popular South African Holiday destination. One of Mozambiques many long sandy beaches and a firm favourite for many years for those in the know, a variety of places to stay along the beachfront along with activity centres offering diving, snorkelling, fishing, quad biking, horse riding and more make it a great family choice. Tucked around a beautiful sandy beach this small village has developed a reputation as a diver and surfer haven with a friendly attitude and a casual relaxed feel to the whole place. Great for youngsters and diving holidays. Approx 250km north of Maputo Xai Xai is a great beach for fishing and relaxing. Accommodation is set along the beach away from the busy little town. Xai Xai a great weekend getaway option for a long weekend. Once a stunning National Park Gorongosa fell into disrepair, over the last decade it has been slowly restored and maintained and is back on its way to being a must see unique destination for wildlife and scenery in Mozambique. So far north in Mozambique it really is like its own country (or even world) the mellow town of Pemba is known for its stunning Wimbe Beach where the clear warm Indian Ocean waters lap onto long prestine sandy beaches. Relax and enjoy. Inland between Zimbabwe and Malawi is this unusual town famous for its bridge spanning the zambezi river. Nearby is the Cahorra Bassa Dam great for Tiger Fishing. Mining is a big development in this area of Mozambique. Only 180km north of Maputo and often overlooked is the small village of Bilene nestled around a lagoon connected to the ocean by a small inlet, it offers shallow quiet water great for families and open beaches outside for fishing. Often called the north Vilanculos is actually only half way up the Mozambique coast and is a seadside town with great beaches to the south. 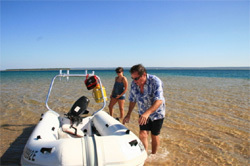 Just offshore are the Bazaruto and Benguerra islands. Dhow trips are very popular here. There is not a large variety of reliable car hire in Mozambique but it is possible, also you can hire in South Africa and take a renatl across border with the right paperwork. Let us know what you need and we will find the best option for you. Still a very undiscovered diving destination Mozambique has stunning diving in several areas, apart from the clear warm diving conditions highlights include Manta rays, whalesharks, turtles and dolphins - uncrowded diving. Inhambane is the town you pass through to access the beaches of Barra, Tofo and nearby Guinjata Jangamo, no real reason to stay in Inhambane itself unless for buisiness as the beaches in town are very average.